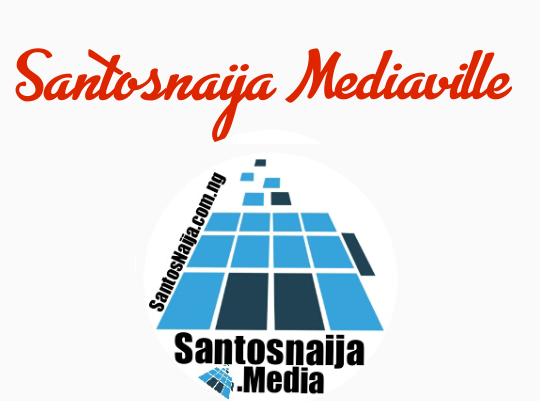 SantosNaija Blog: 4 Years Ago He Was Painting The Streets For World Cup, Now A World Cup STAR! !-- Read Incredible Story Of Brazilian Striker. 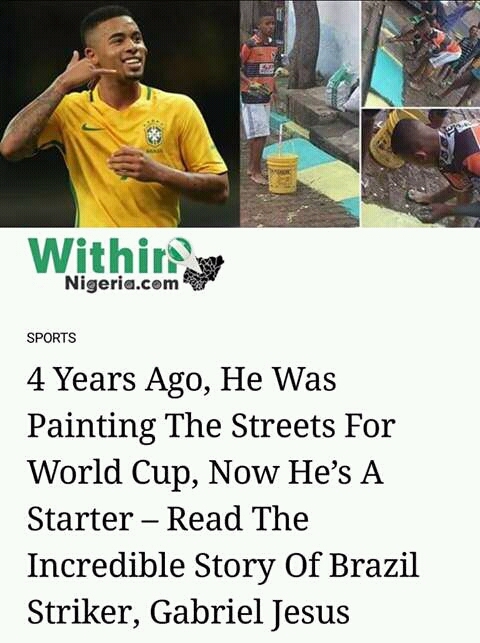 4 Years Ago He Was Painting The Streets For World Cup, Now A World Cup STAR! 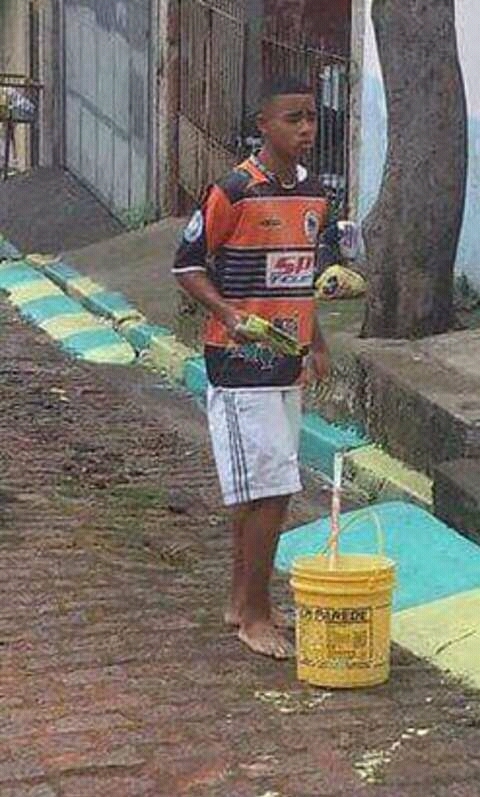 !-- Read Incredible Story Of Brazilian Striker. 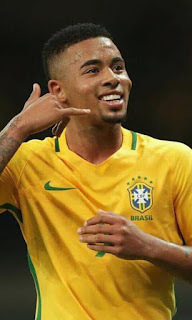 Gabriel Fernando de Jesus (born 3 April 1997), commonly known as Gabriel Jesus (Portuguese pronunciation: [ɡabɾiˈɛw ʒeˈzus]), is a Brazilian professional footballer who plays as a forward for Premier League club Manchester City and the Brazil national team. joined Manchester City in January 2017 for a transfer fee of €32 million, and won the Premier League and EFL Cup in 2018. Born in São Paulo, Jesus grew up in the neighborhood of Jardim Peri. After initially playing street football, he joined amateur clubs in the region, his last one being Associação Atlética Anhanguera. On 1 July 2013, Jesus signed a youth contract with Palmeiras. He was also the club's top goalscorer during the year, scoring 54 goals in 48 matches. In January 2014, after lengthy negotiations, Jesus signed a three-year contract for Palmeiras with an additional two, with his salary to increase from R$15,000 to four times as much in the fifth year; the fee to buy him out from his contract increased tenfold to R$30 million. However, the deal changed the balance of his economic rights from 75–25% in favour of Palmeiras, to 70–30% in favour of his agents. Jesus scored 37 goals in 22 games for Palmeiras in the 2014 edition of the state under-17 championship, leading to offers from clubs throughout the country and abroad. Jesus made his first career start on 29 April in the second leg of the second round of the year's cup, a 1–1 draw at Sampaio Corrêa Futebol Clube (6–2 aggregate). Jesus' first professional goal came in the next round of the cup, away to Agremiação Sportiva Arapiraquense on 15 July, the only goal of the two-legged tie. On 26 August, his two first-half strikes at the Estádio Governador Magalhães Pinto gave Palmeiras a 3–2 win over Cruzeiro Esporte Clube (5–3 aggregate), putting them into the quarter-finals. Four days later he got his first league goals, starting and finishing a 3–2 win over Joinville Esporte Clube; the first goal came after 52 seconds. On 3 August 2016, it was announced that Jesus would sign for Premier League club Manchester City in January 2017 on a contract until the summer of 2021. City paid a reported fee of £27 million/€33 million, plus add-ons. The transfer was fully completed on 19 January 2017. Jesus made his first Premier League appearance on 21 January, coming on as an 82nd-minute substitute for Raheem Sterling in a 2–2 draw with Tottenham Hotspur at the City of Manchester Stadium. A week later, Jesus made his first appearance in Manchester City's starting XI, assisting a goal for Sterling in a 3–0 FA Cup win over Crystal Palace. On 1 February he made his first Premier League start in place of Sergio Agüero, and assisted Kevin De Bruyne in the 17th minute and then scored his first goal for the club in the 39th. With this, he became the first Manchester City player to have a goal and an assist in their first Premier League start, as well as only the third City player to be involved in two or more goals in their first Premier League start. All these has changed through the cause of few years back. 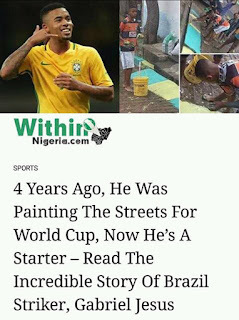 A street painter at the last world cup edition has become a STAR man leading the Almighty Brazil team!. 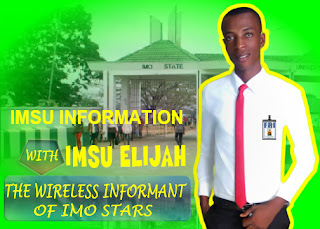 In life, all worthwhile achievement big or little has its own drudgery and triumph, a victory, a struggle and a victory. He worked hard now enjoying the fruits of his labour. He, his family will never lack anytime soon. Make hay while the sun still shines, you will never walk alone.